If you’ve decided to build your home from the ground up, determining which extra features are worth adding—and which are equivalent to flushing stacks of hundreds down the toilet—can be tough. And while it’s OK to put off some decisions, certain additions are prohibitively costly to retrofit. You’re dreaming of radiant heating, you say? It’s way better to install now than sacrifice thousands of dollars later. Not sure what’s a must-do right now? Here are some of the easiest things to add to a new home that will save you a few migraines down the road. In today’s increasingly connected world, future-proofing your home for whatever innovations come next out of Silicon Valley is essential. Luckily, building from scratch allows you to customize your setup to your needs, both now and later. Yes, smart home features are increasingly going wireless, but that doesn’t mean you should skip running cable conduits throughout the house—especially if you see a big home theater or full-home sound system in your future, both of which work best plugged in directly. Adding an extensive system of cable conduits can make hooking up entertainment much simpler. Plus, your own hard-wired system amounts to an eavesdropping-proof local network. Worst-case scenario? You don’t use it, opting for all-wireless instead—but at least it’s there and it’s a feature buyers will appreciate as well. 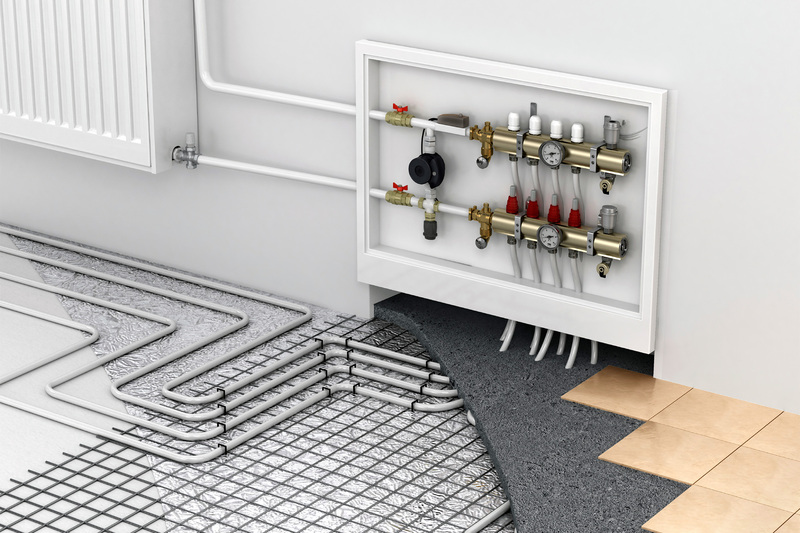 As we indicated earlier, radiant heating, typically integrated into the floor, is energy-efficient but not remotely cheap to install. You can expect to pay at least $6 per foot for your system in new construction. Adding it later? Watch that number double (or more). And it isn’t for everyone. Consider confining it to one room, because it actually can be a limiting factor in future design changes, since the contractor will need to work around it or replace it by zones. But did we mention that if you’re going to install it you should install it now? Install it now. Holiday lights or evening barbecues in the backyard might seem like little more than a distant fantasy when building your new home—especially if it’s 20 degrees outside—but if you’re big on decorating and entertaining, install outdoor electrical outlets now. Adding outlets later can cost upward of $250 each. Adding them during construction, when walls are still open and a licensed electrician will be on site? It’s a no-brainer (and cheap, too). You never know what the future might bring—for yourself or your guests. Shouldn’t your home be capable of entertaining a prize-winning physicist or a popular president without obstacles to their entry? Uh, yes. Aside from any luminaries who might be getting on in years, you might consider designing for wheelchair accessibility for you, or a parent. In new construction, contractors recommend making hallways and doors wide enough for wheeled traffic to travel through and turn around. And reinforcing the bathroom walls will allow you to add grab bars later without opening up the walls. After all, anything that is going to require opening the walls rates high on the difficult-to-retrofit scale. Double-check your plans through the eyes of someone bound to a wheelchair, and ask if it is still so user-friendly. Are you placing all of your switches too high or your outlets too low? Make the investment in your future well-being now, when it’s just a minor expense. Accessibility is important to plenty of buyers as well. It can actually clinch a deal. Forget the Roomba. Central vacuums just make sense. These built-in systems for sucking up dirt and debris not only reduce allergens, they also last longer than traditional vacuums and can potentially increase a home’s value. Installing one in an old home can cost up to $1,000 and requires finding a hidden, quiet spot for the motor in the garage or attic. The addition later on results in needlessly long pipe runs or less-than-ideal positioning of inlets. If a smooth, stress-free vacuuming experience is a high priority, your best bet is to install central vacuuming early, when your builder or architect can work it into your existing floor plan. When you’re building a home, why not take steps to reduce its impact on the environment? During construction is the ideal time to install energy-efficient features that will save you money down the line. Contractors recommend adding reduced-flow showers, low-flush toilets, and reduced-flow faucet aerators, especially if you live in a state affected by drought. Make sure to choose windows and doors with high energy performance ratings, and talk with your builder or architect about adding skylights—which can add much-needed light to a dark room in addition to reducing heating costs and improving ventilation. Are you building the home you want now—or the home that will serve you well for 20 years? In new construction, future-proofing your house can save you thousands of dollars. And lots and lots of angst.